Back in 1986 Judas Priest had an enviable position in the heavy metal world but also a pretty tough task ahead of them. During the past six years they had risen to the top of the metal heap with the outstanding album trio of British Steel, Screaming For Vengeance and Defenders Of The Faith. Each one of these records can easily be counted as true masterpieces in the Heavy Metal Hall Of Fame (especially Screaming in my book). But how the hell can one top that off? In ´86, Priest released their 10th studio album, Turbo as their answer to that question, causing extremely mixed feelings among fans. When comparing Turbo with the earlier masterworks of Priest, you can´t help but wonder, why did they decide to take such an easy path. The year was 1986, and back then, all the latest rage was about……that´s right, Bon Jovi, Def Leppard, Mötley Crüe; in short: hair metal. I´m not saying that as to mock “hair bands”. I love Mötley, Jovi, Leppard and all the similar bands who sang about girls, high times, good rocking and some more girls. These subjects were no odd moments for Priest either (Living After Midnight proves it alone). But Priest was always a bit more dark, more powerful and more ominous in their music than the pretty boys of the day (lets face it, Halford and Co. aren´t pretty boys…..not that I´m paying attention, that is;). The sleaze and saccharine just didn´t suit JP so well. 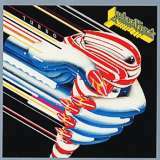 On Turbo, they try too hard to be “in” by making the kind of rock that sold the most at the time. All the previous albums presented Judas as trendsetters. On this one, they are following the trends a lot more then setting them. The performances of the band are also very mixed. The ultimate guitar duo of Tipton/Downing is shredding and riffing as they always have – with amazing skill and force. The solos rip just like they have before, from Tipton´s shredding on Turbo Lover to the awesome harmony leads on Hot For Love. Even though a large part of the riffs would have suited bands like Poison or Warrant a lot better, the guitar work on the album is superb overall. Unfortunately, that it is the ONLY part of this album that is superb. The production is crystal clear and very high quality, but it has its downsides. The drums are the worst to suffer from it. Besides the fact that the beats have extremely little variety and almost no fills at all, the overpolished production makes them sound like drum machines instead of actual drums. This kills the intensity on almost all of the tracks. The bass is there, keeping the backbeat, but nothing great there either. The synthesizer can be an excellent tool for bringing atmosphere and depth into music – metal music too. Iron Maidens Somewhere In Time (their most solid album to me) proved this point to a T. But the synths don´t work on Turbo either. They just sound too mechanical and shallow. I can´t really explain this. It is just in the ear of the listener, and to me the synths on Turbo sound completely out of place. But the largest frustration on this album for me is Rob Halford. I mean, this is THE METAL GOD, for cripes sake! This is the man that just two years earlier recorded killer tracks like Freewheel Burning and Jawbreaker, and four years after this wailed out absolutely murdering classics like Painkiller and Metal Meltdown. He had the abilities to outshine every single metal singer of the current time. Why is he singing with about one tone of voice through the entire album? Why is his singing so restrained? Where are the glass-shattering screams? Where are drill-sharp growls? It´s almost painful to hear such talent going to waste on standardized “eighties-chanting”, like on the sub-par tracks Private Property, Out In The Cold and Reckless (which does have a great wail in the final chorus, that I must admit, but it doesn´t save the song). The only track that truly stands out to me on this album is Parental Guidance. Despite all of its “teenage rebellion”, it just has a different kind of energy, separating it from the other tracks. Turbo Lover, Hot For Love, Rock You All Around The World and Wild Nights, Hot And Crazy Days are OK, they have some vibe in them, but the rest is hopeless filler. It took JP several years to rise up from this creative slump. But gladly when they did rise, Killing Pain with massive power, they once again became the trendsetters at the front line of the attack that they were always meant to be.